simpplot describes the results of a simulation that inspects the coverage of a statistical test. simpplot displays by default the deviations from the nominal significance level against the entire range of possible nominal significance levels. It also displays the range (Monte Carlo region of acceptance) within which one can reasonably expect these deviations to remain if the test is well behaved. In this example we test how well a t-test performs when the data is from a non-Gaussian (some prefer to say non-normal) distribution, in this case a Chi-square distribution with 2 degrees of freedom. We know that the mean of that distribution is 2, so a t-test whether the mean equals 2 is a test of a true null-hypothesis. We also look at how well this test performs in different sample sizes. 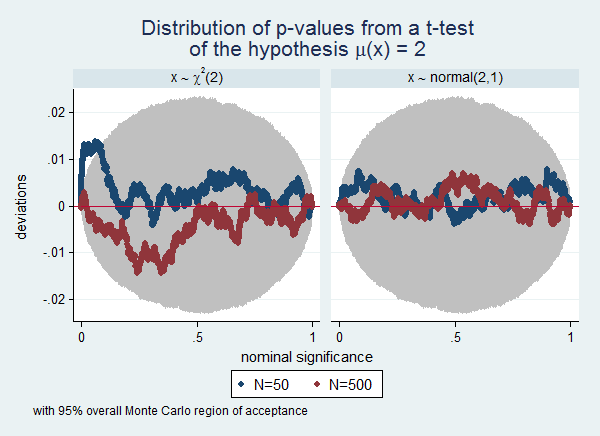 In a sample size of 50 the test does not perform too well, the true null-hypothesis is too often rejected, but a sample size of a 500 seems already big enough for this test to work.
. label var p50 "N=50"
. label var p500 "N=500"
Often a simulation experiment will involve many scenarios, and plotting them all in one graph will make the graph too cluttered to be readable. In that case the by() option can be useful. To continue the previous example, we now also want to know the influence of the distribution of the variable. We extended the example by also drawing from a normal(2,1) distribution. I also use this example to illustrate how use Stata's capability of including symbols in graphs as documented in help graph text. 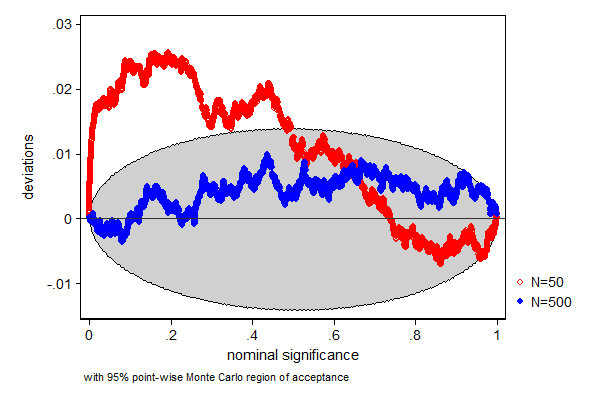 Finally, this example illustrates the use of overall Monte Carlo regions of acceptance instead of point-wise Monte Carlo regions of acceptance. Notice that the regions are wider in this example than in the previous example. This is the to be expected difference between overall and point-wise regions.